You can find her departing from Solomons Island, MD and other harbors in the area throughout the year! 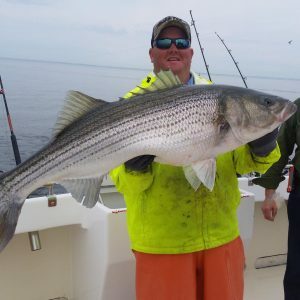 money in Rockfish Tournaments along the way and most recently for about 9 years Steve has been the full time first mate aboard Never E Nuff with Capt. Shaun Pruitt. Steve Scrivener has more time on the water over the past 25 years than most Bay captains will ever have and his experience in a wide variety of situations makes him special. Steve has a great personality and knows how to make sure everyone on board has a good time and catches fish. Wide Open, that’s what you think when you meet First Mate Austin Plumb. Austin was a Dematha Catholic High School Football product (Linebacker) who skipped out on the full ride opportunity because he wanted to keep fishing as a first mate. Austin was born and raised in the Deale, MD area and started working as a first mate for his dad’s charter business when he was just 13. 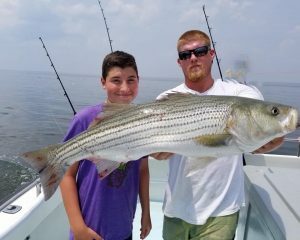 His dad fished the Atlantic Ocean, alternating ports between Ocean City, MD and Hatteras, NC. Austin started fishing on the Chesapeake Bay as a first mate in 2012 for various boats and in 2014 he started working for Capt. Frank Carver aboard Loosen Up and he also started filling in aboard Miss Susie II. The next few years, Austin worked his tail off and became one of the better first mates out there, also working for Capt. Stew aboard Hook Mash in 2017. And January 2018 he joined the Miss Susie Charters Team and he will be the First Mate aboard Miss Susie III. Austin’s personality is infectious and he will keep you laughing. And some of the dumb shxx he says, well anyways, you will just have to meet him!